Financial institutions are the firms that provide financial services and advice to their clients. 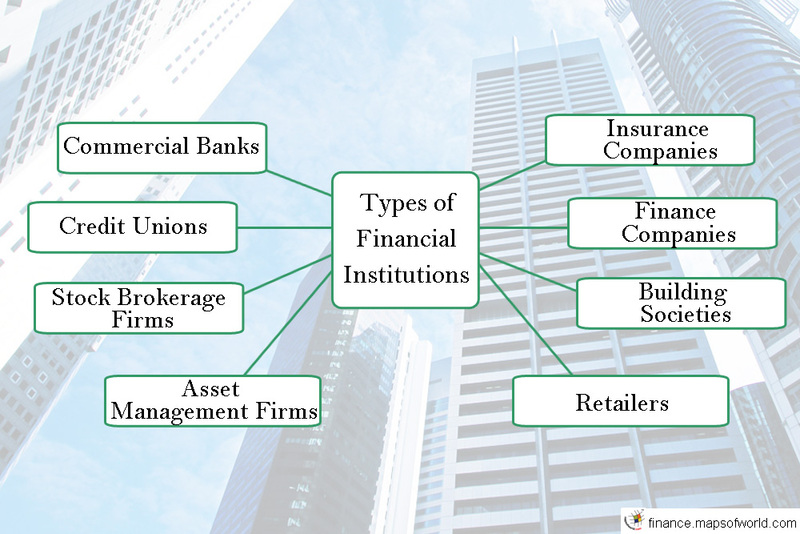 The financial institutions are generally regulated by the financial laws of the government authority. A commercial bank can be defined as a type of financial institution which provides a wide range of services such as mortgage lending, giving business and auto loans and accepting deposits. The commercial bank also deals with basic investment products such as savings accounts and certificates of deposit. The traditional commercial banks come with all facilities such as safe deposit boxes, bank tellers, ATMs and vaults. However, there are some commercial banks that do not have any physical branches. Here the customer is required to undertake all transactions either through the Internet or by phone. Know More: What are Commercial Banks? The Credit Union is known by various names across the world and is a member-owned, not-for-profit financial cooperative. Unlike other banks and financial institutions, the Credit Unions are established and operated by the members. In the Credit Union, the profits are shared amongst the members. There is no set standard for the Credit Union. It can range from an organization with just a few members to a large one where there are thousands of people. In the Credit Union the members pool their money in the bank so that they can provide loan money to each other. Further, the profits that are achieved are employed to fund projects and services for the overall benefit of the community. Some of the services offered by the Credit Unions are online banking, share accounts (savings accounts), share draft accounts (checking accounts), credit cards and share term certificates (certificates of deposit). Know More: What are Credit Unions? The stock brokerage firm is responsible for facilitating buying and selling of financial securities between a buyer and a seller. A brokerage firm serves a clientele of investors and employs a number of stockbrokers through whom they trade public stocks and other securities. Once a transaction has been successfully completed the brokerage company receives compensation, which is by means of a commission. Full-service brokerages offer estate planning services, tax advice and consultations. A discount brokerage charges less money than the traditional brokerage and here clients conduct trades via computerized trading systems. In online brokerages, the investor is offered a website to conduct his or her transactions. Services offered include Insurance, Securities, Mortgages, Loans, Credit cards, Money market and Check writing. Know More: What are Stock Brokerage Firms? An asset management company is beneficial as they provide the investors with more investment options than they would have by their own as they have a much bigger pool of resources. The company will invest the pooled funds of its clients into securities that match declared financial objectives. Asset management companies manage hedge funds, mutual funds and pension plans. They charge service fees or commissions and may either charge set fees or a percentage of the total asset under management. Know More: What are the Asset Management Firms? The insurance company is one which signs a contract, which is represented by a policy, and provides an entity or individual with financial protection or reimbursement against any losses that may occur. The insurance company is instrumental as a means of protection of financial losses, both major as well as small, resulted from damage to the insurer or his or her property. There are numbers of insurance policies; however, the most important ones are health insurance, life insurance, home insurance and vehicle insurance. Services offered include Insurance services, Securities, Buying or selling service of the real estates, Mortgages, Loans, Credit cards and Check writing. A finance company is defined as an organization that provides loans to businesses as well as consumers. A finance company is similar to a bank as it acts as a lending entity by extending credit. However, unlike a bank, a finance company does not accept deposits from people. In fact, finance companies get their funding from banks and other resources. The role of a finance company is to extend credit to companies for commercial use and to individuals to make various purchases. It may also provide financing for instalment plan sales. Know More: What are Finance Companies? A Building Society is defined as a financial institution that gives banking and other financial services to its members. The Building Societies are owned by the members of a mutual organization. Services offered by Building societies include mortgages and demand-deposit accounts. They are often supported by insurance firms. The term Building Society dates back to the 19th century England. It was introduced from groups of co-op savers in the building trade. Though mainly found in the UK, building societies also exist in other countries such as Australia, Ireland and Jamaica. A retailer sells goods directly to consumers with an aim of earning a profit. This is done through various distribution channels. Retailers can vary in size ranging from small family operated stores to big supermarkets. Large retailers buy directly from a manufacturer or wholesaler and then sell the product to the end user at a marked up price. The retailers rarely manufacture their own product. They mainly act as a link in getting the product from the wholesaler and selling it to the consumer. The various financial institutions generally act as intermediaries between the capital market and debt market. But the services provided by a particular institution depend on its type. The financial institutions are also responsible for transferring funds from investors to the companies. Typically, these are the key entities that control the flow of money in the economy. The services provided by the various types of financial institutions may vary from one institution to another. For example, The services offered by the commercial banks are insurance services, mortgages, loans and credit card.